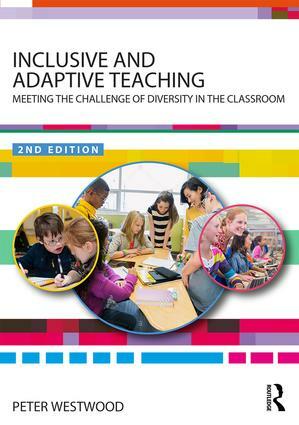 From bestselling author Peter Westwood, this new edition of Inclusive and Adaptive Teaching provides a considered approach to meeting the ongoing challenge of inclusive teaching in the classroom and offers a range of strategies for good practice. This comprehensive resource promotes a fully inclusive approach to teaching and outlines the necessary adaptations and accommodations that are often required in order to address the needs of the very diverse population of students now to be found in most classrooms. Drawing on the ever-evolving practices of inclusive education and research into learning theories, Westwood describes useful, evidence-based strategies for adapting curriculum content, learning activities, assessment and resource materials. Fully updated to reflect cutting-edge international research and teaching practices, this new edition gives additional focus to the role of digital technology, differentiation, the teaching of STEM subjects and support for inclusivity in higher education. ways of implementing inclusive assessment of learning. Each chapter contains an up-to-date list of online and print resources easily available to teachers who wish to pursue topics in greater depth. This is an invaluable resource for both practising and trainee teachers and teaching assistants, as well as school principals, school counsellors and educational psychologists. The book focuses on what really matters to teachers by providing excellent, concise background information and then focusing is on what teachers can do – strategies and approaches. Peter Westwood is a freelance education writer and editor. He has taught in primary and secondary schools, and has taught for many years in universities in England, Australia and Hong Kong. He is widely published in the field of education and his range of books includes Commonsense Methods for Children with Special Educational Needs and Learning Disorders, both published by Routledge.